The oil and shipping markets are heavily focused on the re-imposition of US sanctions against Iran, which may hit up to 1 million b/d of oil exports. The market will watch closely for how the European response may develop further after the European Commission announced Friday that it had launched a formal process to activate the Blocking Statute, a piece of legislation that forbids EU companies from complying with the extraterritorial effects of US sanctions. Europe consumes around a third of Iran’s crude exports, and European refiners are already having difficulty shipping Iranian oil. Shipowners are starting to avoid this route because of the risk of US sanctions. In agriculture, European biodiesel prices are expected to slip as large quantities of imports from Argentina and Southeast Asia begin arriving at the continent’s ports. The imports will add to already high stocks. In gas and power, traders are looking to US data vendor Weather Company to release its first outlook for winter this year. This will provide traders with their first indication of what temperatures they might expect, and help determine their trading strategies. And in metals, contract negotiations in the European flat steel market kick off this week, and mills are showing a steely resolve. They’re looking to increase settlement prices with their major industrial customers. In this week’s highlights: The biodiesel market expects a tumble; gas and power traders eye next winter’s weather outlook; and steel mills are feeling bullish about prices. But first: the oil and shipping markets are heavily focused on the re-imposition of US sanctions against Iran, which may hit up to 1 million barrels a day of oil exports. The market will watch closely for how the European response may develop further after the EC announced Friday that it had launched a formal process to activate the Blocking Statute, a piece of legislation that forbids EU companies from complying with the extraterritorial effects of US sanctions. Europe consumes around a third of Iran’s crude exports, and European refiners are already having difficulty shipping Iranian oil. Shipowners are starting to avoid this route because of the risk of US sanctions. EC President Jean-Claude Juncker has said the EU is fully committed to the continued, full and effective implementation of the 2015 Iran nuclear deal, as long as Iran respects its obligations. The oil markets will be watching closely for signs of political efforts by European government representatives in Brussels to seek a waiver on Iranian sanctions which may hit up to 1 million b/d of oil exports from there. The likelihood of exports from Iran plunging has unsettled the oil market. Brent crude futures last week briefly traded above $80 a barrel. As well as the risks to Iranian supply, Brent’s rise to its highest level since 2014 was driven by a number of factors, including an unexpected crude stock drawdown in the US, as well as the economic and political crisis in Venezuela. Some have questioned the sustainability of current oil prices, which leads us to our social media question: Do you expect oil to finish 2018 up or down from current prices? Tweet us your thoughts with the hashtag #PlattsMM. Talking about sustainability, European biodiesel prices are expected to tumble, as large quantities of imports from Argentina and Southeast Asia begin arriving at the continent’s ports. The imports will add to already high stocks. The recent rise in the oil complex has caused biodiesel demand to soar. High gasoil prices have made it an increasingly cheap substitute for some buyers. However, the latest flood of product looks set to outweigh the additional demand, putting downward pressure on prices. In the gas and power markets, traders are looking to the Weather Company on Monday. The US data vendor is set to release its first outlook for winter this year, providing traders with their first indication of what temperatures they might expect. Long-term weather outlooks are rarely as reliable as near-term forecasts. But warm or cold, the weather has a huge impact on gas and electricity demand for heating. And that will play a critical role in determining trading strategies. Finally, contract negotiations in the European flat steel market kick off this week, and mills are showing a steely resolve. 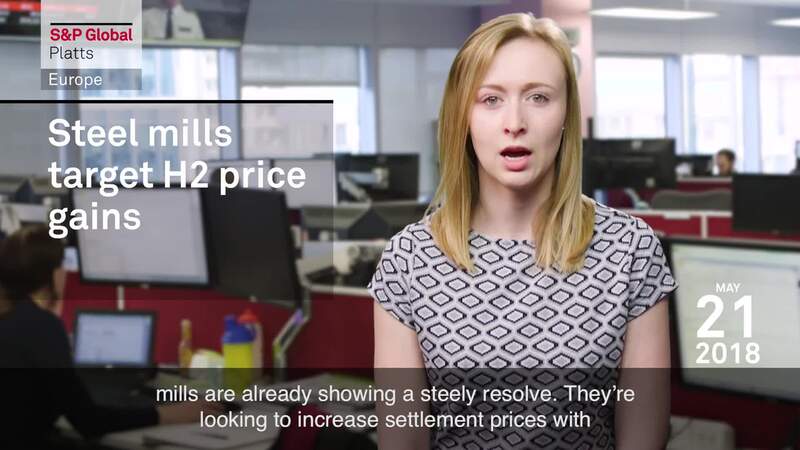 They’re looking to increase settlement prices with their major industrial customers, announcing increases of 20 to 40 euros in offer levels from 530 to 540 euros a metric ton. Such a move would further increase margins in the European steelmaking sector. In the first quarter, Luxembourg-based ArcelorMittal, the world’s largest steelmaker, improved its EBITDA per metric ton of steel to $101. That’s the highest since 2012.